I found this 20cm long juvenile common wolf snake (Lycodon aulicus) at my hospital. I had tough time identifying it as it did not have the distinctive white bars which wolf snakes have. My good friend Sharath B.K was kind enough to identify it for me. I used Canon EOS 5D mark II with Canon EF 100mm f/2.8 USM Macro using Canon MT-24EX macro twin light flash. 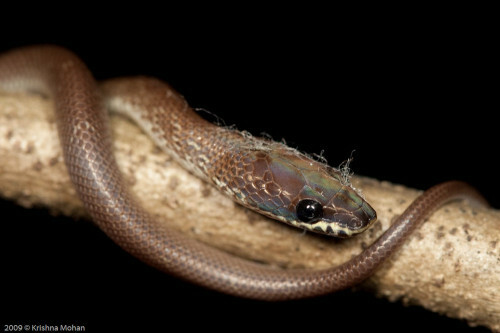 Characteristics: A small, broad and flat snouted snake. It has a constricted neck and a muscular, cylindrical body that gradually tapers towards the tail. The colouration of this snake may vary with its wide habitat. The stereotype dorsal colour for this snake is chocolate brown with yellow transverse stripes. Nearly all varieties have a brown underbelly. Most specimens found in Sri Lanka have a dark brown dorsal colouration and well defined white stripes. Behaviour: A strict night hunter, being nearly inert by day. Upon nightfall this snake bursts into action. It prefers low vegetation close to human dwellings for they harbour its most preferred food, lizards in large numbers. This snake often enters houses in search of geckos and often stumbles upon an unsuspecting human. This snake instinctively flees if disturbed by a human but attacks viciously if barred of all opportunity of escape. The fine teeth of this snake often inflict serious injury. During the day it remains coiled up and will only hide its head amidst its coils if disturbed. Food: This snake feeds mainly on lizards and frogs. Breeding: Due to the wide distribution of this snake its reproductive habits vary considerably. 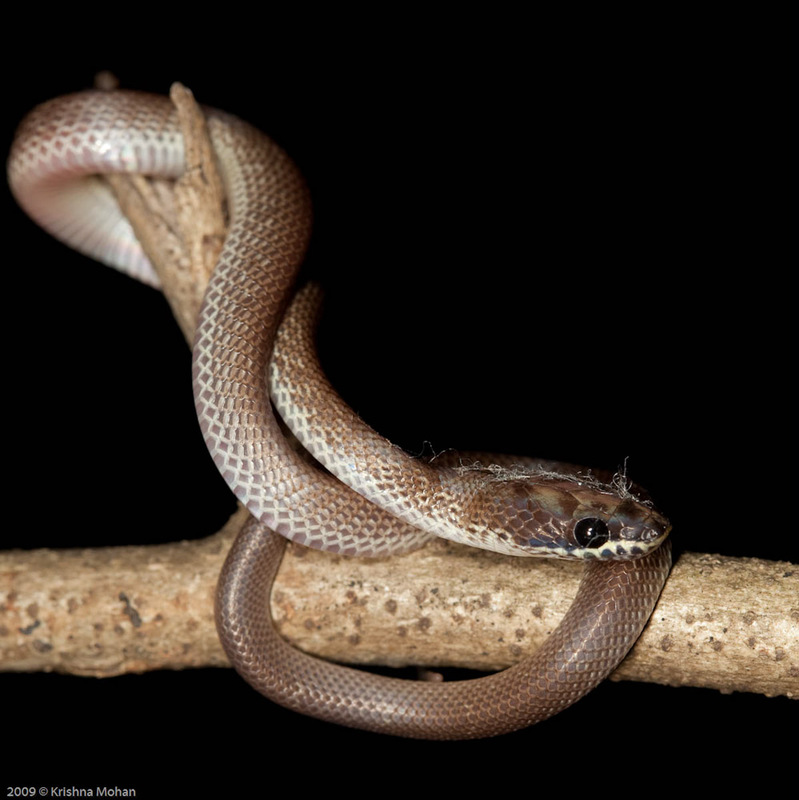 In most areas which receive rain during the southwest monsoon and in Sri Lanka the mating season for this snake lasts from November to January. In other areas this takes place between June and August. The exact period of gestation is not precisely known and seems to vary according to the external conditions. Usually the eggs are laid in February and most possibly the young hatch out in late April or early May before the onset of the monsoon. The clutch is usually within the limits of 4 and 7 but older females may lay up to 11 eggs at a time. The oval shaped eggs measure on average 30mmx11mm. Growth: During the moment of hatching the young measure around 150mm in length. The new hatchlings jump start into action and begin to feed voraciously on lizards. These snakes reach maturity after two years and females are capable of reproducing once 45cm long. Females grow longer than males. Females may reach lengths in excess of 70cm while males seldom grow longer than 55cm. Very nice details of this , under exposed back ground adds a lot. This is a nice description about the snake. Nice work. I Want to know whether this snake is non-venomous . It is non venomous snake and quite a friendly one too. But it mimics poisonous snake and gets killed mistakenly by people who cannot distinguish it from the poisonous one. Thanks a lot for the good information. I wanted to identify the snake and to know weather is poisonous or not. Thanks for the great work.